Our Nature Program at the Art & Nature Center provides fun and education for all ages. We are raising funds and having fun Saturday, February 9th from 2:00PM to 4:30PM! We have a $10 suggested donation, but all donations are welcome. Come and have some refreshments and play a few games and support our wonderful summer program!
. The wood violet won possibly due not to its grandeur but it’s bright blue violet color and friendly face. The plant is about 2 to 5 inches tall and is found growing in clumps in shady spots, meadows, along roadsides and sometimes creeping into lawns. The flowers may be blue, violet or white. Each flower has five petals. The two lateral petals are bearded and hairy near the base and one petal points downward forming a symmetrical shape. The leaves are heart-shaped with scalloped edges and the flower emerges on its own stalk without leaves. After blooming the fruit capsule forms, dries and pops allowing the seeds to spread. The plant has a rhizome and fibrous root system. - The wood violet is from the Violaceae family which has 400 to 500 species around the world. - It’s Latin name, papilionacea, means butterfly. The blooms often look like a butterfly with wings from a side view. - The flower and leaves are edible. Recipes include the flowers in salads, soups, jellies and is popular candied for wedding cakes. We are beginning to see a collage of blooms in the Spring woods. The yellow Trout Lily is bending her head, the Bellwort is dancing and the white showy blossoms of the Trillium take command. The flower, three white petals and three stamens atop a single stalk with a whorl of three leaves was given it's name from the Latin, trilix, referring to the sets of three. The plant stands about 12” tall and is found in shade and sunlit areas. plant to reach maturity, approximately six years from seed to flower. Picking the flower seriously injures the plant and unfortunately it is a favorite food of the white-tailed deer. In three states, Minnesota, Michigan and New York it is illegal to pick or transplant as it is becoming rare in some areas. The plant grows from a rhizome root and grows singly and in colonies. It likes a slightly acidic soil and has a preference for the Maple and Beech forest. - Trillium is a member of the Liliaceae family. - The seeds are mostly spread by ants, who take the fruit to their underground homes, eat the fruit and leave the seed behind. - The flowers turn pink as they mature. - Although it takes many years for the plant to mature, the plant can live for seventy years. A beautiful drive on Washington Island to see Trilliums is on the east side of Washington Harbor, the northern end of Airport Road that turns into Washington Harbor Road. 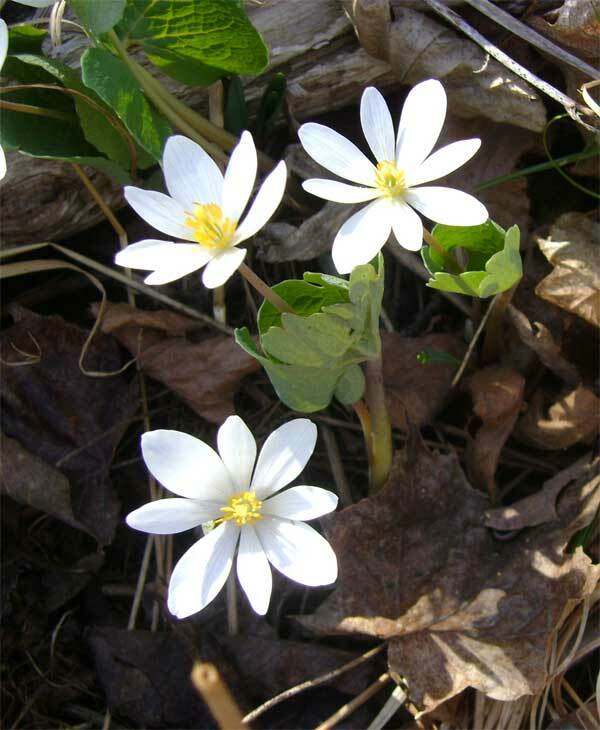 One of the early wildflowers to emerge in the woodlands on Washington Island is the star-like blooms of the Blood root. This single flower is surrounded with a single lobed leaf which is wrapped around the bud and unfolds as the flower blooms. The white waxy flower consists of eight to twelve petals and opens to the sun and closes at night and is about six to seven inches tall. The unique name comes from it's red sap in the stem and rhizome root which was used for medicinal purposes and dye by Native Americans. Be aware, it's toxic properties are harmful to the skin. After the flower dies, the interesting scalloped leaf continues to grow and changes from a silver green to a blue green and blends into the summer woodland carpet. 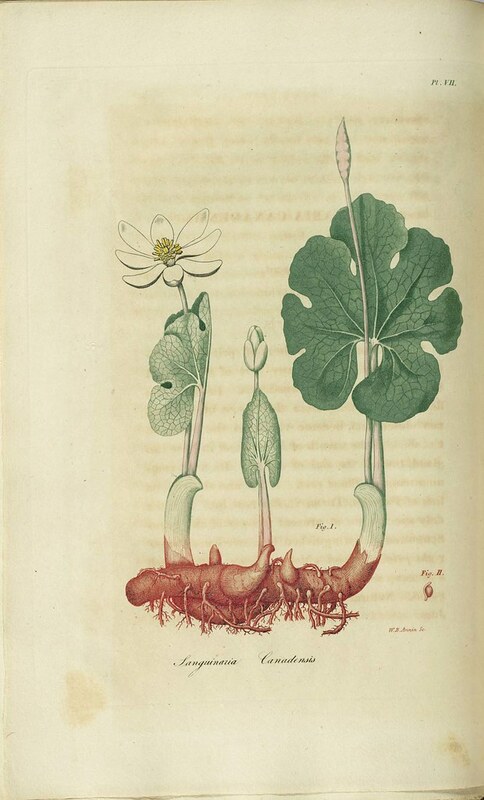 - The Blood root is a member of the Poppy family. - Ants are attracted to the plant's seeds which assists in propagation, while flies and bees are busy with pollination. - The simplicity and beauty of this flower has likened it to be called the Little Northern Lotus. 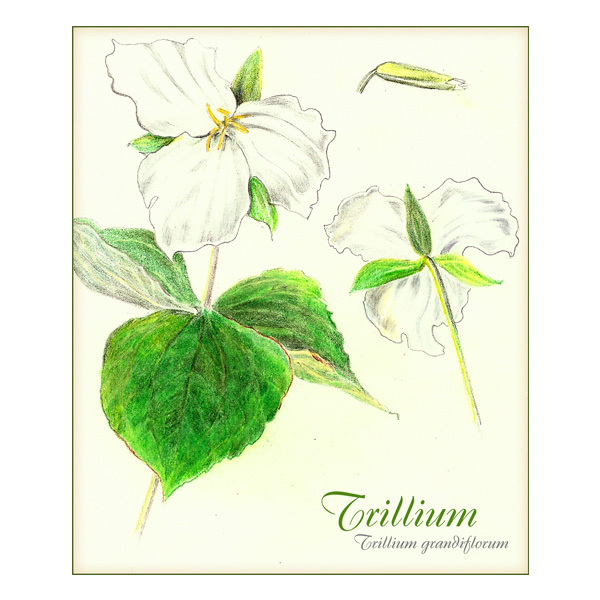 Join us next for the Trillium. Note: The botanical drawing is from the rare book, American Medical Botany by James Bigelow from the collection of the late Chester Thordarson of Rock Island which is now in the library of the University of Wisconsin. Spring is finally upon us on Washington Island and it is a welcome sight. We have set upon a journey to search out the gems of the forest, or wildflowers. We begin with the sweetness of the Hepatica. Among the brown winter leaves and fading drifts of snow the first flowers to make their appearance are the Hepatica or more commonly known on the Island as, Mayflowers. The sepals may be pink, purple, blue or white and are found growing in clumps about 3" to 6" tall. The leaves are three-lobed that come to a point. Green leaves emerge after the plant flowers which darken with patterns of brown and purple as they mature. The flowers have a delicate fresh scent. - Hepatica, or Liverwort received it's name from it's leaves which resemble the human liver and was used as a medicinal herb to treat liver disorders. - Butterflies, moths, bees, flies and beetles are known pollinators. For more information, check out Door County's Wildflowers: A Field Guide For The Curious by Frances M. Burton and Aurelia M. Stampp. 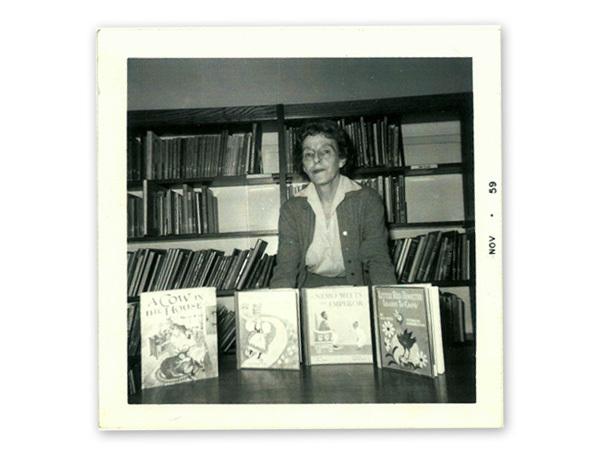 Katherine Evans, an accomplished Illustrator was highlighted in the very first show at the Art and Nature Center in 1965. She is well known as the Illustrator of the children's book, "The Littlest Angel" which has become the fifteenth best-selling children's book of all time, including it's numerous editions. Katherine Floyd Evans, born in Sedalia, MO in 1899, was multi-talented, fearless yet ladylike, whimsical, and a keenly intelligent artist who came to the Island with her family for the summers in the early 1900's. Her parents came up to the Island from Missouri on the Goodrich boats, leaving from Chicago and arriving in Washington Harbor. In the early days, they stayed at the White House but then bought a home on Detroit Harbor that is still owned by the family. She studied in Paris at the Ecole des Beaux Arts, in the Art Colony in Provincetown, and at the Chicago Art Institute. She was always an artist . . . drawing, painting, sculpting . . . but when her husband died she made a living for herself and her two children as a children's book writer and illustrator. Traveling the world for up close and personal views of Mexicans, Ethiopians, Parisians, West Africans, and others, she illustrated more than 75 books for children and used many of those experiences to inspire her paintings and her life. She passed away in her summer home on Detroit Harbor in 1964 surrounded by the natural beauty that meant so much to her. Many Thanks to Katie West and David Evans for sharing their history, photos and illustrations. If you are interested, check out your local library where many of her books are still available. 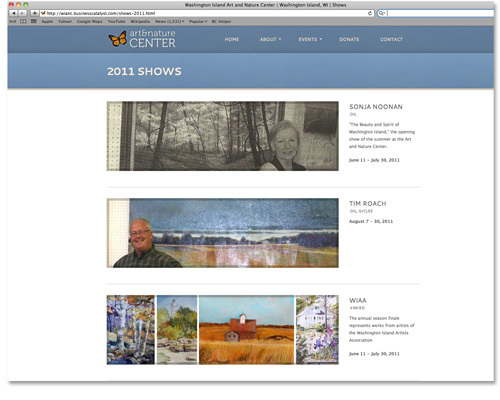 Welcome to the new website of the Art and Nature Center. We hope you will find it a great resource on the ANC and what it has to offer. Here’s a little tour of what we’ve been working on. Our HOME page will guide you to exactly what you are looking for. Are you researching your trip to the Island and want to visit us? Want to sign your kids up for a class? This is the place to start. The bottom is where the latest blog posts are and a sneak peak at some of the featured works. Did you know that from 1904 to 1964, the building housing the ANC was a schoolhouse? If you want to learn more, check out the ABOUT page. Are you interested in joining or you'd just like to donate? Our membership page will soon have a Paypal button so you can donate online. If you are looking to make some summer plans, check out the links under the EVENTStab. Not only is our blog located there, but special pages for classes, calendar and photos and info about past and upcoming shows. We have a special link to our membership page with our DONATE button. We are so grateful to our community and beyond for all your memberships, donations and volunteers. We really appreciate your continued support. If you are planning your trip and need a map, check out the CONTACT page. And if you have any questions, please use our contact form. We’d love to hear from you! If you have any comments on our new site or the ANC, feel free to leave them below. We've been working hard on a new website and can't wait to show you!